Rub floral charm on your targeted customer base by handing them these customized 2x3.5 florist business card magnets round corner – 20 MIL. This cost effective and high quality marketing business card magnets work perfect for nurseries, florists, bouquet deliverers, interior decorators and others trying to make their “business messages stick”. These magnets bear 20 MIL thickness and they are printed on high quality gloss paper with laminated finish, which offers high impact to business messages. Free shipping, free artwork and free online design proof are offered on bulk orders. 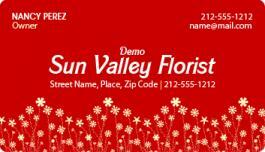 Request a quote to know wholesale discounts for these loving custom 2x3.5 floral business card magnets round corner – 20 MIL.